With this mini-loaf pan from Alegacy Foodservice Group you can produce a variety of personal sized breads, cakes, meatloaf and more. A great size for gift baskets or when serving a crowd. Constructed of aluminized steel glazed for easy release and cleaning. Reinforced rim adds lasting strength. Professional pastry chefs count on Alegacy's line of bakeware to keep their creations rising perfectly every time. Loaf pan yields 12 loaves each measuring 3-1/2 x 2-1/2-Inch. 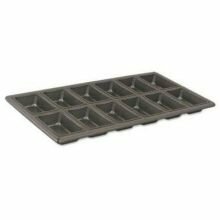 Overall size of mini-loaf pan is 9-7/8" x 19-1/2". Item No.B6903Since 1947, Alegacy has been providing the ultimate in quality professional cookware at extremely competitive pricing. and we've done so while maintaining our core principle, "customer satisfaction is the most important thing we offer." Our extensive array of top-end products is constructed to the Alegacy standard of quality and value. NSF approved. Vollrath Stainless Steel Oval Au Gratin Dish, 20 Ounce -- 12 per case.